My favorite meat is pork. I love it in all its delicious fatty forms. It is so versatile and I really can never tire of all the different ways it is prepared. 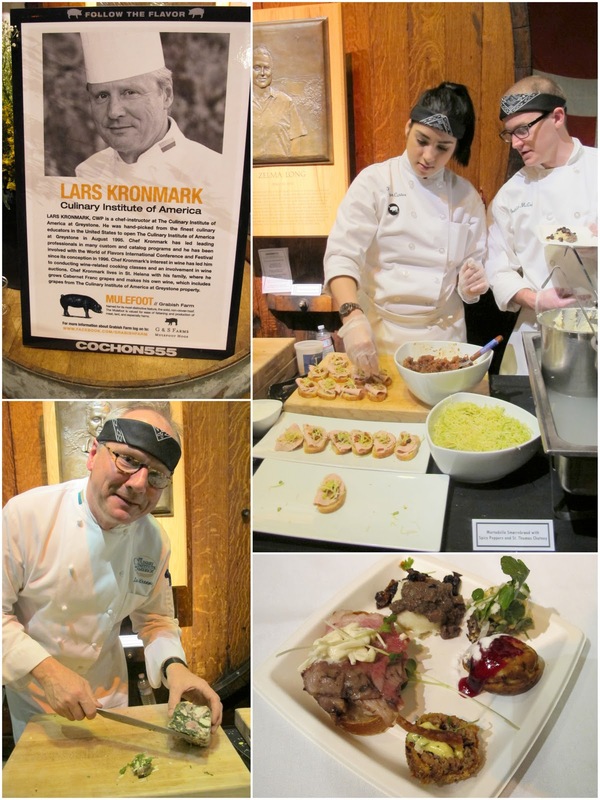 It was no wonder that I wanted to go to Cochon 555. 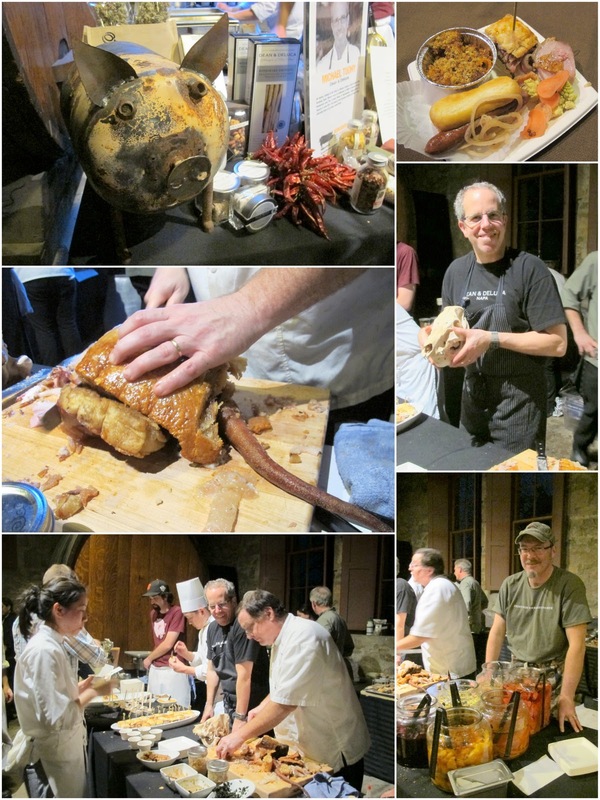 "Cochon" is French for "pig" and the 555 means - 5 chefs, 5 pigs, 5 wineries. What could be better? 2012 is the fourth tour of Cochon. It was established as a way to support family farms that raise heritage breed pigs. 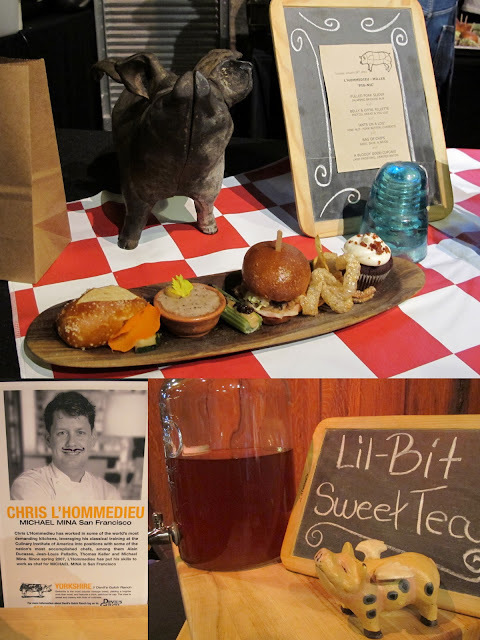 The tour stops at 10 U.S. cities where the five chosen chefs compete to make the best dishes from their heritage pigs. The winners from each city then go on to compete in the Grand Finale at the Aspen Wine & Food Classic. If you like what you see in this post, then consider going to the final Cochon event in San Francisco scheduled for May 20th. One of the competing chefs for the Napa event was someone we Sacramentans are familiar with - Michael Tuohy, formerly the chef at The Grange. And one of his sous chefs? None other than our own blogger/author, Hank Shaw. I had high hopes for the home team and couldn't wait to see what they came up with. The event was held at the Culinary Institute in St. Helena.This was my first time at the glorious stone structure of Greystone. We were up in the large Vintner's Hall with walls decorated with plaques of famous vintners and giant wine cask facades. At the front stage there were butchering demonstrations and a pork raffle. $15 for a raffle ticket and you could win a portion of the pig that was butchered. I think each winner went home with about 25 pounds of pork. 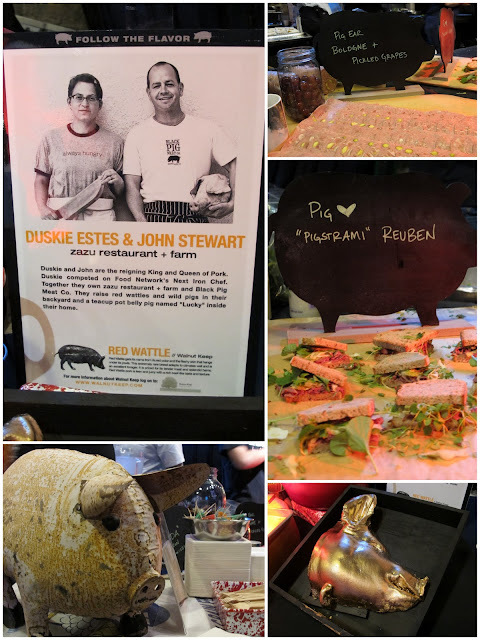 Each chef's team was given a different heritage pig and had to come up with at least six items. There were two Bershires, a Yorkshire, a Mulefoot, and a Red Wattle. Each chef's team was composed of his own assistants as well as some of the Culinary Institute's students. 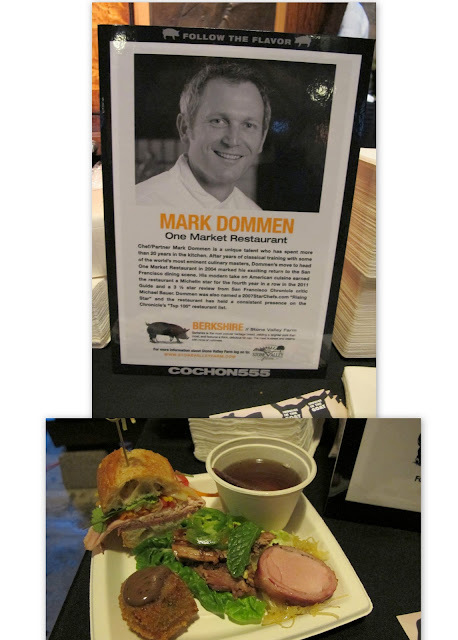 The next chef's table was Mark Dommen from One Market Restaurant in San Francisco. He served a Berkshire pig. The highlights from his table included a pork broth make from all the pig extras and bones and in it was a pig's blood ravioli. Blood is an iffy taste for some people and I found it intriguing, but it's the super flavorful broth that won me. Their croquette of head, feet, tail was melt in your mouth perfection. They also had a fabulous banh mi, but my favorite item was the simple lettuce wrap. The refreshing lettuce showcased the succulent pork inside. Chris L'Hommedieu, of Michael Mina Restaurant, had some fun at his table, as you can even see from his mustached poster. His pig was a Yorkshire. They gave everyone a pig-nic bag filled with picnic items. I actually took advantage of that and saved it for the end. My favorite item from his selection was the belly and offal rillette. Too bad the accompanying pretzel roll was like a puck. He was also the only one who baked a dessert with a Bloody Good Cupcake with lard frosting and candied bacon. Team Tuohy's table had quite a line. They were serving Berkshire items to order, which meant a wait, versus the other tables that kept plating out servings for you to just pick up. Tuohy's new haunt is Dean & Deluca. Regarding the menu after the event I realize I missed the Moroccan spiced pork and chickpea stew. He had a nice chorizo mac n cheese, but the winner for me was the porchetta. The meat was juicy and sweet contrasted by the massive crunch from the crackled skin. The other great thing at his table was the large selection of condiments. Hank was manning the pickle jars as well as some of the many other extras to finish off some of the items. I particularly liked the Asian pickled radishes I tried. The final table was that of Lars Kronmark from the Culinary Institute. His team prepared a Mulefoot pig and they won the evening's competition. You see the lovely terrine above. I liked one of the simpler items of mashed potato with an offal sauce over it. I am not fond of eating offal by itself very much, but do think it adds wonderful flavor when mixed as an ingredient. The mixture of liver, kidneys, and who knows what else, melded together to make an earthy, rustic sauce. There was one culinary student busy with an aebleskiver pan. Inside the puffs there was a shredded pork mixture and then they topped it with a beet jam and a vinegar salt. I stuck around long enough to see if I won the Name the Ingredients contest by Le Creuset. There was a stew that had five ingredients and if you guessed correctly, you got your choice of any piece of cookware. Unfortunately I fell into the psychological trap that most people did. I automatically put pork since we were at a pork event, but it turned out it was a lamb stew! Shame on me for not recognizing it - the power of pork suggestion was too strong. I was too full to stick around for the final pork feast. John Fink of The Whole Beast and Jonathan Bodnar of Smoakville wheeled out tables of barbecue items. A final pig had been barbecuing outside until the finale celebration. It also served to promote another culinary event in July - Heritage BBQ. I was in food coma and still had the drive back to Sacramento, so I decided to sneak out early. It did look like a lovely spread. Oh, and for you wine drinkers...The five wineries at the event were Elk Cove Vineyards, Scholium Project, Matthiasson, Wind Gap, and Behrens Family Winery. The San Francisco event will be on May 20th, location to be announced. Tickets start at $125 and VIP is an extra $50.